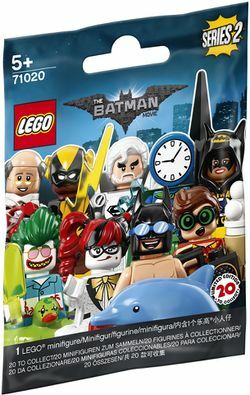 71020 The LEGO Batman Movie Series 2 is a Minifigures series released on January 1, 2018. This is a description taken from LEGO.com. Please do not modify it. (visit this item's product page) Discover new heroes and villains in LEGO® Minifigures—THE LEGO BATMAN MOVIE Series 2. Bring exciting new play possibilities to existing LEGO® sets with LEGO Minifigures. This new, awesome lineup of exclusive, Limited Edition collectible characters makes a perfect addition to first THE LEGO BATMAN MOVIE series. Enjoy all-new action-packed adventures with Swimsuit Batman™, Vacation Robin™, Vacation The Joker™, Disco Harley Quinn™, Vacation Alfred Pennyworth™, Vacation Batgirl™, Doctor Phosphorus™, Clock King™, Mermaid Batman™, Killer Moth™, Jor-El™, General Zod™, Apache Chief™, Bat-Merch Batgirl™, Hugo Strange™, Disco Alfred Pennyworth™, Black Canary™, Black Vulcan™, Wonder Twin Zan™ and Wonder Twin Jayna™. 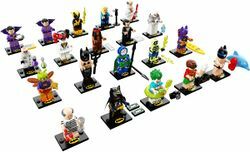 Each LEGO DC minifigure comes in a sealed ‘mystery’ bag, together with one or more accessory elements, plus a collector's leaflet and a new-for-January-2018 display plate with a printed Batman™ logo. Facts about "71020 The LEGO Batman Movie Series 2"
Discover new heroes and villains in LEGO® Minifigures—THE LEGO BATMAN MOVIE Series 2.